Citation Information: J Clin Invest. 2007;117(2):464-472. https://doi.org/10.1172/JCI28949. Local administration of iloprost suppresses asthma features. Mice were sensitized by i.p. injection of OVA/alum (see Methods) on days 0 and 7 and were exposed on days 19–21 to OVA aerosols. Prior to each aerosol, mice received an i.t. injection of vehicle, CAY10449 plus vehicle (OVA/CAY+vehicle/OVA), 0.2 μg iloprost, or CAY10449 plus iloprost. Labels indicate sensitization/treatment/challenge. (A and D) BAL fluid was analyzed by flow cytometry. (B) May-Grunwald-Giemsa staining of lung sections. 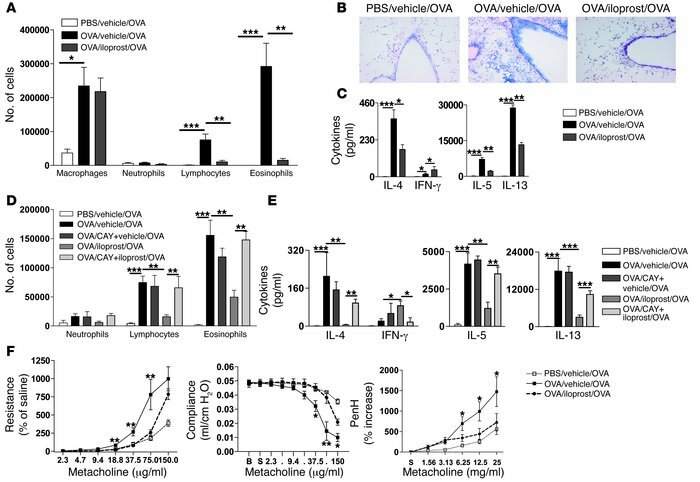 (C and E) Cytokine production in MLN cells restimulated in vitro for 4 days with OVA. (F) BHR to various doses of i.v. metacholine was assessed for changes in dynamic resistance and lung compliance and BHR to inhaled metacholine for PenH responses was assessed 24 hours after the last antigen exposure were measured. Data are mean ± SEM; n = 8 mice per group. *P < 0.05; **P < 0.01; ***P < 0.001.